Mississippi is an interesting place to reside. I won’t delve into the near endless list of problems and issues that haunt my state but it is a long list. What I will talk about are some of our excellent bookstores, in particular Turn Row Book Company of Greenwood. You might have heard of Greenwood, especially if you’ve recently redone your kitchen with a Viking range. In this small Delta town, Turn Row offers an excellent variety of Mississippi and regional authors, but what really interested me was their cookbook of the month club. It was more than two years ago, but I was in Greenwood for a cooking class at the Viking school, and I had arrived a little early. Popping my head into Turn Row, I found a goldmine of signed Alton Brown cookbooks. They may have been generically signed, but I had been looking for AB’s cookbooks and who turns down a signed copy? While checking out with my massive stack of books, I read a small sign about their cookbook of the month club. I signed up on the spot. Unfortunately, with each passing month I never saw any sign of a package from Turn Row, but my credit card wasn’t being charged so it was pretty much out of sight out of mind. Well, early this year, I was googling cookbook of the month clubs when I remembered Turn Row. I gave them a call only to find that the cookbook club had never really gotten off the ground, instead they were now doing a personalized book club. Turn Row knows that the market for signed first editions in Mississippi is pretty much covered by Lemuria in Jackson and Square Books in Oxford; in an effort to offer a unique product, Turn Row asks for a list of your recently read and favorite books. From that list, they create a book of the month club that is tailored to your interests. A few days after signing up for the club, my first book arrived. It was a cookbook, Where Flavor Was Born by Andreas Viestad . Where Flavor Was Born has an interesting premise, Viestad, a Norwegian chef who resides in both Oslo and Cape Town, attempts to take the reader on a whirlwind tour of the countries that border the Indian ocean. He contends that without the spices of the Indian Ocean countries, the world as we know it would not exist. He makes a compelling argument by listing the efforts of Columbus and Marco Polo and, a little more pertinent to this review, the spices that play an intrinsic role in so many dishes of national identity. From saffron in French bouillabaisse to the cinnamon in your cappuccino, Viestad wants you to know just how important these spices are to your perception of world and local cuisine. With less than 300 pages in the book, it’s a foregone conclusion that Where Flavor Was Born will barely skim the surface of the cuisine of the 11 countries Viestad has chosen. 11 countries? Yep, Viestad focuses on sampling the cuisine of Indonesia, Malaysia, Thailand, India, Oman, Egypt, Reunion Island, Mauritius, Tanzania, Mozambique, and South Africa. Sure, he left out a number of countries like Somalia, Kenya, Sudan, Saudia Arabia and Yemen, but I’m not complaining. There are still plenty of recipes to get your hands dirty. Flipping through the Table of Contents, I couldn't help but be amused at how Viestad has organized this book. Instead of being separated by numbered chapters, the book is divided by spices and descriptions. 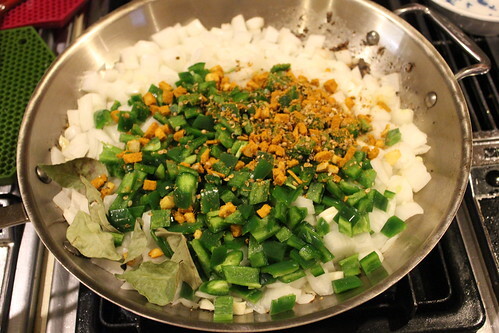 It starts with Cumin and from there goes to Simply Spicy to Pepper to Ginger etc. Organizing the book this way is frankly brilliant. It almost forces the reader to look through dishes from each country instead of skipping straight to their favorites. Of course with this many cultures, countries and recipes, choosing where to start is an uphill battle. 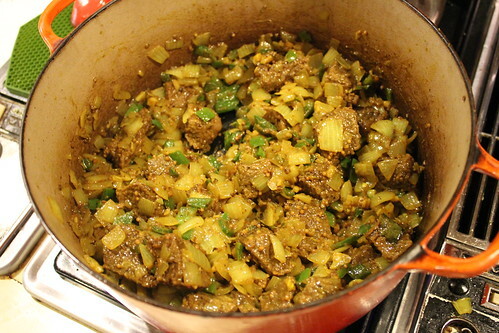 Flipping through the Curries section of the book, I came across the recipe for Kerala Spicy Beef Curry or Mattirachi Peralen. 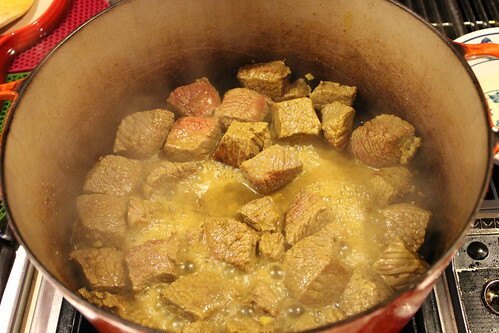 I haven’t delved into the world of Indian or even Anglicized Indian cuisine as much as I would like but I do know that beef is a relatively rare offering in an Indian cookbook. 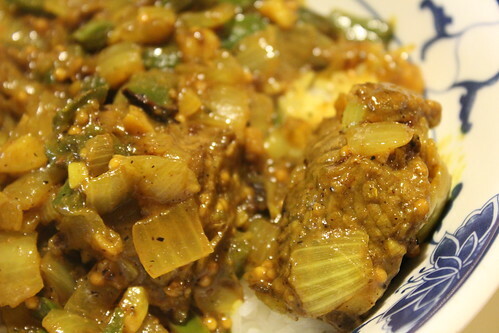 Viestad explains that this dish hails from Kerala, a fairly secular state in that south of India and the sole state that allows the slaughter of cattle for human consumption. Hoping to begin my relationship with this cookbook on the right foot, I dove headfirst into the recipe. 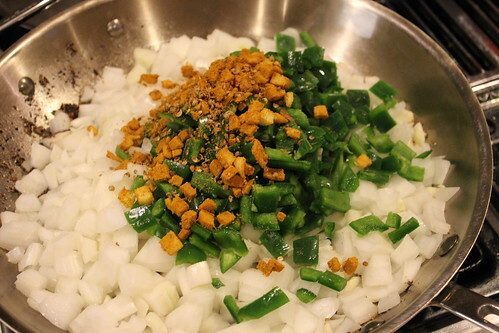 · Chopped cilantro or parsley for garnish. Culling together the ingredients for this recipe was pretty easy even if I did have to do a little extra digging through the pantry. 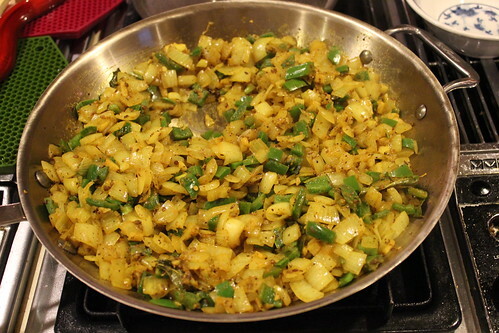 The first part of the recipe calls for the ginger, turmeric and coriander. After some peeling, chopping, and crushing, I had the first of the spices ready. Almost immediately, I began to notice some problems with this recipe. 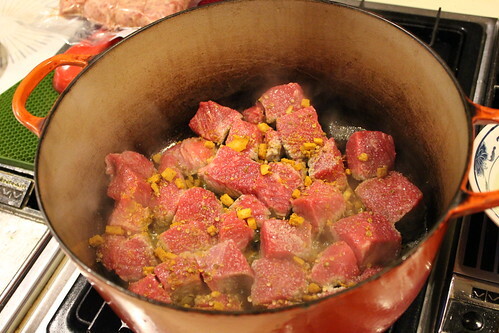 The first step calls for two tablespoons of oil to be heated in a large pot over high heat, the meat to be added and then, after it’s added to the pot, to be seasoned with the salt and half of the ginger, turmeric, and coriander mixture. I have no idea how big a pot Viestad was using but this was my biggest Dutch oven. Here’s what you get when you follow this recipe to the letter. 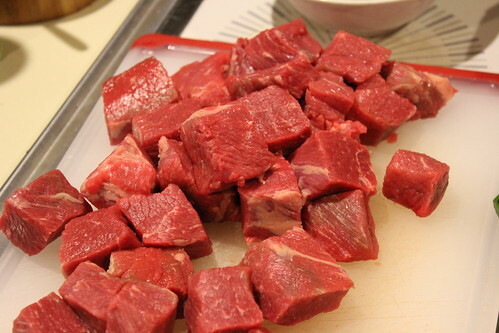 Three pounds of beef cut into 1-inch cubes, no matter how you try, will not sear in this situation. Nope, all I got was a lot of stewing. I would later find out that this wasn’t the first mistake in the recipe. 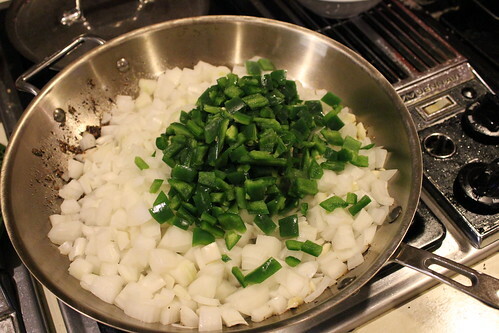 10 minutes of “searing” later, it was time for the next step in this four part recipe. 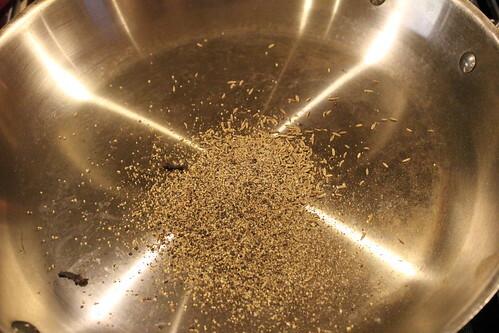 The beer, mustard seeds, and two tablespoons of vinegar are added to the pot and everything is brought to a boil and then simmered for 1 ½ hours. In case you were wondering which beer I used, I reached for the first lager in my beer fridge. 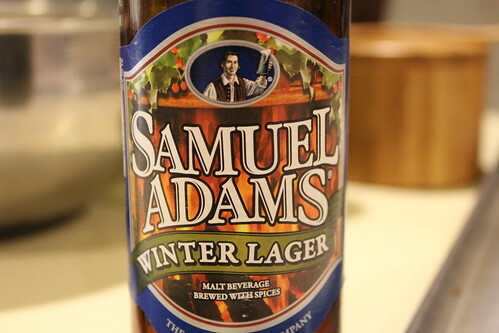 Samuel Adams Winter Lager, it may not the ideal lager for Indian cuisine, but it worked. An hour and half later, things were looking interesting. I’m not sure why the recipe calls for this to be cooked without a lid. 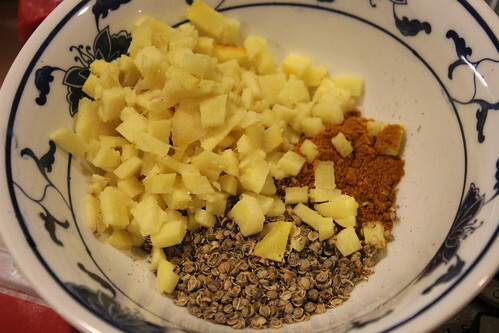 Meanwhile, I started with the third step in the recipe which meant dry-roasting spices. The idea was to roast the cloves, cumin, black pepper, and the remaining coriander; unfortunately, I had already mixed the coriander with the ginger and turmeric. 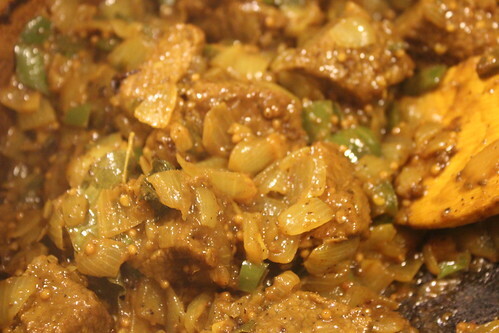 All mistakes aside, it was a few minutes over medium heat before the spices began to become really aromatic. 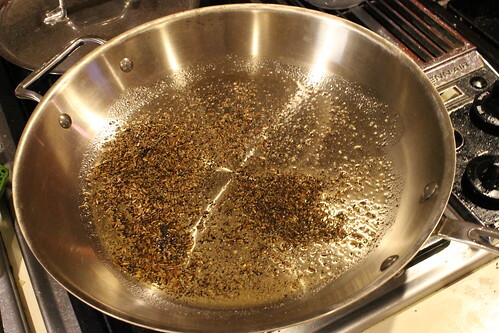 Once the smell of cumin, cloves, and pepper filled the air, I added enough oil to coat the skillet. 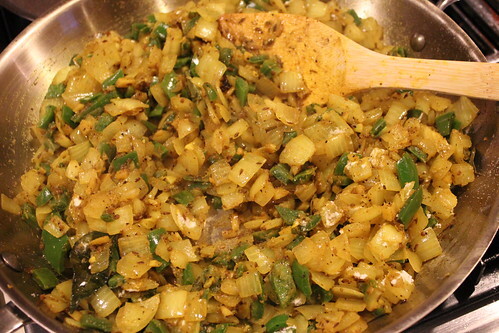 This pan-full of ingredients was sautéed for a good 3-5 minutes. By then the onions had softened and everything, including my spoon had been dyed a wonderful shade of yellow by the turmeric. 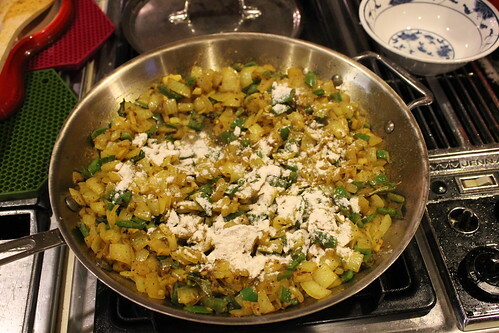 At this point, it was time to sprinkle on the tablespoon of flour. I know the idea is for the flour to tighten up the dish, but I had my doubts. Things got a little clumpy at this point. Now it was time for step four, adding everything together. 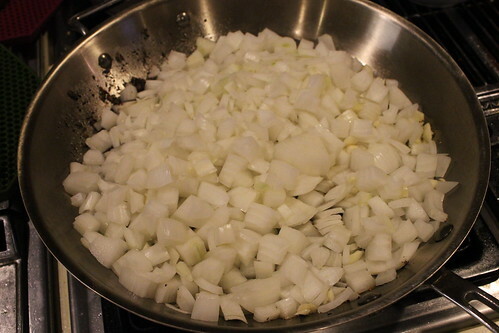 The onion mixture was introduced to the beef and everything was cooked on low heat for another 15 minutes. 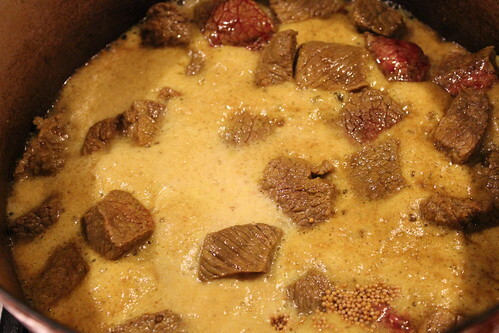 The beef isn’t swimming in a coconut milk gravy, but it looked quite juicy. Feeling a little lazy, I skipped the Yellow Rice and went straight for steamed white rice for this dish. There was a nice flavor to this dish, but there was a glaring problem. Viestad advises the reader to season the dish with salt, honey, or more vinegar, but no topping in the world could cover the root problem of this dish, dry beef. 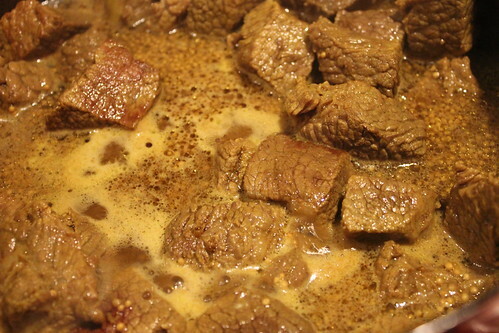 In the recipe introduction, Viestad writes this brisket that “with prolonged cooking, as required here, (the meat) becomes wonderfully moist, tender, and flavorful.” Well, the dish may have been flavorful, but 1 ½ hours and a bottle of beer is not enough time and/or liquid to render a piece of brisket tender and juicy. 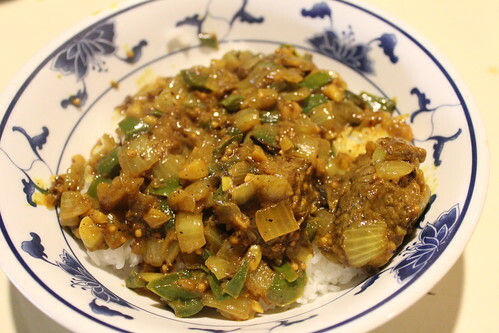 What should have been a dish of that celebrated the flavors of chilies, coriander, ginger, and vinegar was stuck in the muddy blandness of dry, chewy beef. I’m not ready to put Viestad and Where Flavor Was Born away for good but this Kerala Spicy Beef Curry was not the auspicious beginning I was hoping for.